Yeva (also known as Beauty) lives with her father and two older sisters- Lena and Asenka- in an aristocratic city. Although she is being groomed for a life among the rich, Yeva can’t help but long for the freedom of the forest. Only there can she strip away all semblance of refinement and hunt as her father- one of the best in the land- taught her. Having grown up on tales surrounding the strange and magical creatures that reside in the forest, Yeva is enchanted by the idea that there are hidden secrets within the wilderness- secrets that few except her father have discovered. When her father suddenly loses his fortune and higher standing in the city due to a business transaction gone wrong, he moves the family to his old lodge, situated on the outskirts of town. Secretly relieved that she no longer has a reason to associate with the baronessa and other ladies, Yeva is able to spend time with her family and explore the edges of the forest. Her father, who now has to revert back to his hunting ways to feed his family, starts to venture further and further into the forest to find game. But every time he physically returns, it seems that his mental health has deteriorated just that little bit more, and soon Yeva worries that he is beginning to lose his mind. Refusing to allow Yeva to accompany him, he starts to obsessively track a creature through the forest- The Beast- until one day, he doesn’t return back to the lodge. Determined to find him, and ignoring the protests of her sisters, Yeva journeys into the heart of the forest, on the trail of the Beast. There, she discovers a strange new world, not unlike the ones in the childhood stories her father had told her. She also encounters the Beast, becoming his captive and undergoing the forced training he believes will save him from his terrible curse. Despite her situation, Yeva finds herself drawn into this peculiar, magical life, but still holds onto her yearning for revenge against the Beast- who she believes is the cause of her father’s madness and subsequent downfall. Will Yeva be able to overcome the Beast and escape this magical world, with its ruined castle and supernatural creatures? Or is she destined to stay in this cursed valley forever? In the end, it’s a question of survival- who will make it out of this fairytale story alive? The Beauty, or the Beast? This retelling of The Beauty And The Beast, set in medieval Russia, makes use of old Russian folklore and fairytales to create a unique and fresh storyline. Yeva’s character is strong and independent- a fantastic role model for young girls and women- who is determined to save her father and ensure that the rest of her family is safe and secure. Yeva’s childhood tales (which are mixed within the narrative) add to the fantastical elements of the story, giving small hints at what is to come, while, at the same time, not giving too much away. The diary entries of the Beast also provide a telling look into his life- before, during and after his encounters with Beauty- and help readers to understand his mental anguish and behaviour. The way they are presented throughout the novel also dictate the level of control he has over the curse that affects him, making for even more compelling reading. 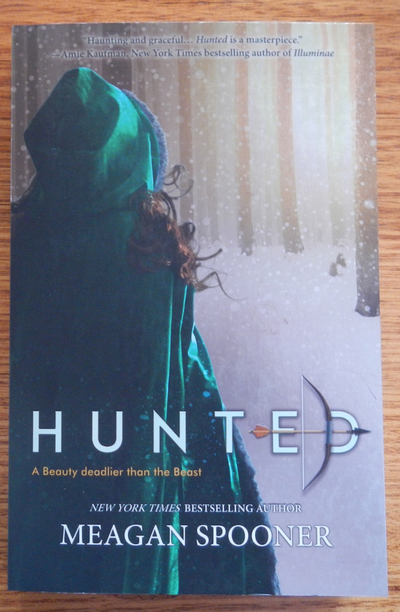 Hunted is a well-written and absorbing version of Beauty and the Beast. If you’re a fan of fairytale retellings, this is one that you should definitely consider reading.